Favorite past-time (or even obsession) of many an Emperor, aristocrat, and shogun, and inspiration for numerous sublime paintings and poems, falconry and hawking were not OPENED UP to the general public until the fall of the Tokugawa Shogunate in 1868. Even then, it was (and still is) a prohibitively expensive and time consuming hobby for the average Japanese. But being a much older tradition than the tea ceremony, flower arrangement and most (or ALL) of the Japanese martial arts, it is not surprising that in this country where so many average people strive to emulate or take on the habits, manners, tastes, and attainments of the old ruling classes, several schools of hawking and falconry (takagari, 鷹狩り), both classical and modern, live on in Japan. And though the shotgun is the weapon of choice for nearly all of Tsukuba’s hunters, don’t be surprised if you run into a falconer, or a whole group of them, especially along the banks of the Hanamuro River. They are hunting for pheasant, duck, and other small game, which they flush out of the bush with dogs. They are usually armed with sparrow-hawks, goshawks and peregrine falcons. Evidence for the existence of falconry in Japan predates the appearance of writing, as several clay figurines (haniwa, 埴輪) from the so-called KOFUN Period (5-6th century), portray hunters with birds of prey on their shoulders (of course they could also be interpreted as being pirates with parrots on their shoulders!). These have been unearthed from the tombs of local rulers. 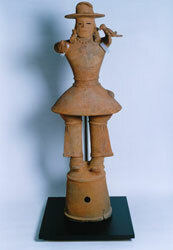 One them, shown above, is from nearby Gunma Prefecture. Falconry is mentioned in Japan’s second oldest official written record, the Nihon Shoki (720), where it is described how a Prince of Paekche, in Korea, came to Japan and taught Emperor Nintoku how to hunt with a trained bird. In classical times, many of Japan’s great emperors — Saga, Uda, Daigo, Ichijou, and Shirakawa — poets such as Otomo no Yakamochi, Ariwara no Narihira, AND the first official Barbarian Subduing Generallissimo himself – Sakanoue no Tamuromaro, were all falconry fanatics. An official agency for the sport was created by the Heian Court. 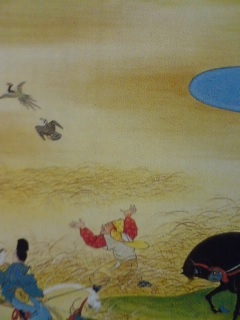 In medieval times, when Japan was ruled by the warrior class, new schools of falconry were established. One interesting aspect of the popularity of this blood sport was how it was justified by its ostensibly Buddhist practitioners. 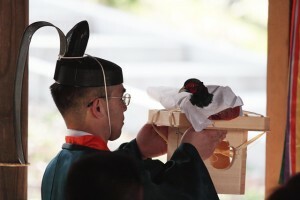 This was done by emphasizing the connection between falconry and its Guardian Deity — Hachiman, the enshrined spirit of Emperor Ojin — and the God of War, and by offering captured game to the God of the Suwa Shrine. 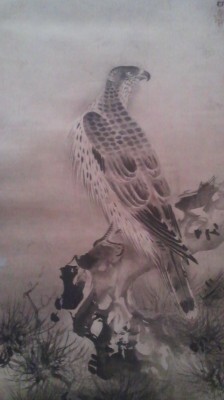 It was in the the Edo Period (1600-1868), however, that falconry REALLY flourished (with the exception of the tenure of Tsunayoshi, the animal-loving shogun), as the founder of the dynasty, Tokugawa Ieyasu, was probably the greatest supporter of falconry that Japan has ever known. He imposed strict controls on the nobility’s hunting and designated vast tracts as his personal hunting grounds, forbidding farmers in those areas from harming ducks or geese and also making them help out in hunts, which could last days or weeks. So don’t be too surprised if you come across some people with dogs and large birds. It’s just an old tradition around here. Here are some websites with pictures and videos. 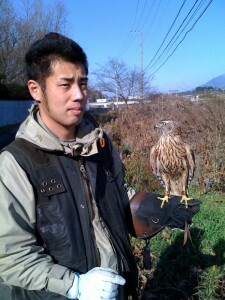 The picture above of the hunter with a goshawk in Tsukuba was taken by Rick Weisburd.